Info-activism.org, a Tactical Tech initiative, explores how rights advocates “use information and digital technology to create positive change.” Actions are broken down into 10 tactics that, through the site, provide original and artful ways for rights advocates to capture attention and communicate a cause (see video, above). The website includes a 50-minute film documenting inspiring info-activism stories from around the world and a set of cards, with tools tips and advice to help people plan their own info-activism campaigns. Further details of the launch are available on the BBC News website. 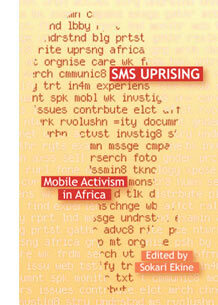 The book is essentially a collection of essays by people engaged in using mobile phone technologies for social change, and it provides an analysis of the socioeconomic, political and media contexts faced by activists in Africa today. The essays address a broad range of issues including inequalities in access to technology based on gender, rural and urban usage, as well as offering practical examples of how activists are using mobile technology to organise and document their experiences. Contributors include friends Sokari Ekine (Blacklooks) – also the editor – Amanda Atwood (Kubatana.net), Juliana Rotich (Ushahidi), Christian Kreutz (Crisscrossed.net) and others. Congratulations to everyone at Tactical Tech and Fahamu on their initiatives, both of which provide valuable contributions to a growing body of literature on digital activism. Thanks also for the invitations to contribute – an honour and a pleasure! Ken Banks is founder of kiwanja.net, a site that helps nonprofits use mobile technology to serve their communities’ information needs. See his profile page, visit his blog, contact Ken or leave a comment. Follow Ken on Twitter at @kiwanja.